I had the house all to myself for about 10 days, and I spent most of the time sewing, watching movies, and having fun. Here are all of the Dresden Plate Table Toppers that you saw in my previous post. There are 12 of them in the pile; most are Christmas themed, but there are two autumn, one Patriotic, one Valentine's and a couple have fruit and can be used in summer. All that's left to do on these is to hand sew down the bindings. I've tried to sew the binding on the machine on one of them, and it looks awful. I'm going to rip it out. I really enjoy hand work, so I'll finish them by hand. Some of these are for gifts, some for donations for silent auctions, and some of them I'm going to keep. My Dresden Plate Table Topper tutorial can be found here. The tutorial found at the link is for a Halloween Table Topper. These pillowcases were all cut out, and every time I picked up the pile of pieces, one of the cuffs would fall out of the pillowcase it was matched up with. So I sewed my way through the pile until all 31 pillowcases were finished. I do a french seam on my pillowcases so that all of the raw edges are enclosed. You can see how I enclose the seam cuff in my Hot Dog Pillowcase Tutorial here. Awhile back, I went to Back Door Quilts for a sewing day with the Quilts for Kids Group. I finished 3 quilt tops that day from kits that the QFK coordinator provided (I added a few of my own strips to her kids....like the Kaffe fabrics). I did some machine quilting on these 3 tops, and next I'll make binding and sew it on by machine. Since these quilts are going to be used by kids, everything has to be done by machine. These blocks are for my Smitten quilt. The pattern is by Jen Kingwell. I started the blocks that you see a few months ago. 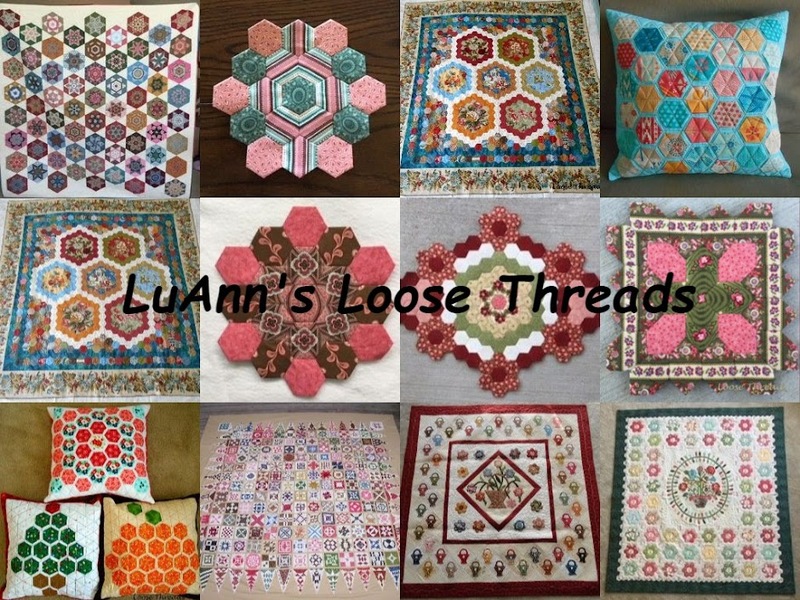 My friend, Michele, from English Paper Piecing Addiction Group is moving right along with her blocks. Michele told me that the smaller pieces could be cut from a jelly roll. Since we were at Back Door, I picked up a new jelly roll and last week I cut block kits enough to finish the quilt top. I still have to glue baste the pieces and sew. I'm kind of anxious to get back to this project again now that I have all of the block kits cut. I also really love making these 2" six pointed stars. In the bottom right hand corner of the photo, you can see some of the pieces that I fussy cut last week while I had a lot of my fabrics pulled out. These stars are going to be one of those projects that I'll hate to see come to an end. These are one of my favorite things to English paper piece. I also bought this Bronco's fleece and crocheted around the edge of it and have sent it to my brother-in-law and sister-in-law in Colorado. We have a friendly football rivalry since our Colts traded Peyton Manning to the Broncos. I even found variegated yarn in Bronco's colors to do the edging. After all of that, I had to take time to clean up my sewing room. I have part of the two Patriotic quilts you can see a bit of in the bottom corner of the photo already machine quilted. I still have to finish a bit on each quilt. One is for a donation quilt, and one is to keep. I'll show you a better photo when I have the quilts finished. It's been awhile since my last post, so I thought I'd let you know what I've been working on. I have somehow gotten myself into a lot of things that require a deadline, and they all seem to be coming due at once. I sometimes get that "I can save the world" mentality, and get myself into way too many things. Here are some Dresden Plates I've been working on. Some of these are for my own projects, but the fan blades were all over the sewing room. I decided it was best to sew them together so they would be all in one piece. This Dresden plate table topper is for a silent auction donation. I love to hand applique', but sometimes it isn't always possible. I did machine applique' on the Dresden plate following Harriet Hargrave's directions. Mastering Machine Applique' is a great book. This book tells what settings to use for different sewing machines and has lots of valuable information and illustrations. You can find my tutorial for this quilt as you go table topper here. I also made 20 pillowcases using my Hot Dog Pillowcase tutorial here. At some point I need to update my tutorial because it doesn't show how to do the french seam finish. I made 10 Frozen and 8 Avengers pillowcases for donation to a DAR school. Another Frozen pillowcase went to my niece's daughter who is 5, and a Mickey Mouse pillowcase went to my Grandson (I forgot to take a photo). I'm also in a signature swap with a group of quilters. I've sewed, signed, stamped and colored 70 plus blocks for the swap in November. I made a few extra blocks to have signed by friends that didn't sign up for the swap. There's still more things I've committed to do, and I'll show you those as I finish. I am really missing my EPP projects. Sometimes when I get a bit overwhelmed by the quilting things that I've promised, I grab some yarn and crochet a bit. You can see my crochet projects on my Easy Crochet blog here. My Dresden plate table topper tutorial is here. My Hot Dog Pillowcase tutorial is here. I'm linking to Thank Goodness It's Finished Friday at What A Hoot! I have a new addiction.....er ..ummm..hobby. I'm making fabric postcards! They are really fun and pretty addictive. This is one I made to send to a friend. I hand sewed the flowers on before I added the fabrics, lace and ribbon. I'm still not totally sure what I'm doing, but it's been a lot of fun working on these. It's also nice to find a use for some of the decorative stitches on my sewing machine. I made this card to send to my grandson, Daniel, to thank him for asking me to go to the State Fair. This was my first card. I had the Valentine fabric close at hand, so that's why I made a Valentine card. The card has a piece of Peltex in it to make it stiff. It's fusible on one side, and is available at most fabric stores by the yard. I cut mine about 4 1/4" X 6 1/4". I bought a box of envelopes to mail my cards. I know they would never go through the mail as a regular post card would, and the envelope keeps them intact and clean. So if you are thinking about doing this and are going to send your postcards in envelopes, then it's best to get the envelopes first and then cut your Peltex to fit. When we went to Nancy's house for our quilt retreat a few weeks ago, I noticed that she had made several postcards. She showed me her supplies and her cards and explained how she makes them. Then later on, she showed me how she sewed one of her cards. She also gave me several ideas of postcards I could make and send. As you can see, I kind of jumped into this with both feet. I even bought a carrying case to keep my supplies together. Here are just some of the things I've found to make more cards. Several of these came from the Dollar Store. JoAnn Fabrics has a lot of cute things to use. I found some of the things I used on Daniel's card in the scrapbooking section. I'm still quilting. Next time I'll show you what I've been working on.